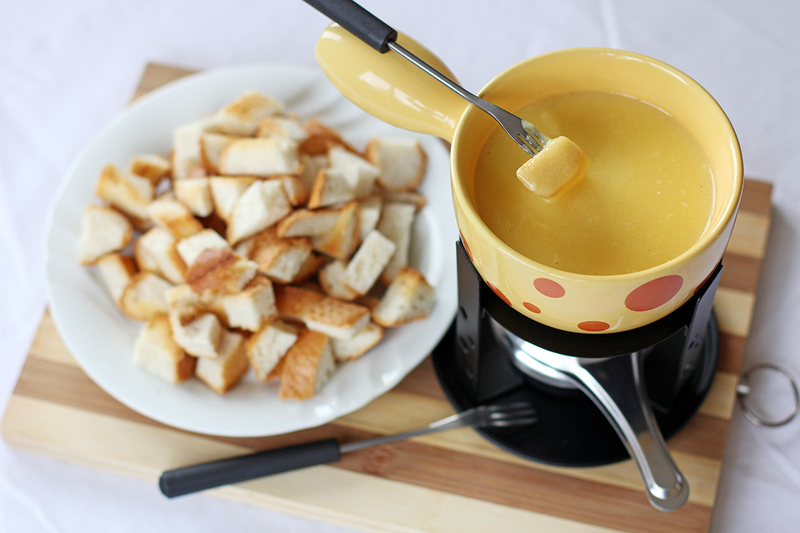 The word fondue came from the French word fondre which means “to melt”. Earliest recipes were also found on the book called “Käss mit Wein zu kochen” (To cook cheese with wine) which was published during 1699 in Zurich. The recipe states that cheese are to be grated and melted with wine, and for bread to be dipped in it. In 1930 the fondue started to get popular when the Swiss Cheese Union (Schweizerische Käseunion) promoted fondue to become the Swiss national dish, in doing so it will help their economy as cheese consumption will definitely increase. It then became popular in the United States in the late 1960’s when it was introduced by Swiss restaurateur named Konrad Egli. He started with fondue bourguignonne at his Chalet Suisse restaurant in 1956 then the chocolate fondue in the mid 1960’s as part of a promotion for Toblerone chocolate. There are different types of cheese fondues from the normal ones Neuchâteloise (mix of Gruyère and Emmental) to flavoured ones where either cream, Tomato, peppers, eggs and/or Mushrooms are added. Like some dishes this have its traditions and it says that if a man drops his bread on the post then he will have to buy the drinks for everyone, and if it’s a woman then she must kiss her neighbours. In a covered container mix together Emmental, Gruyere and cornstarch. Cover container and shake to coat cheese inside. Rub the pounded garlic inside a pot then pour wine and lemon juice. Place in a stove top and simmer on low heat, once it gets hot slowly add in the cheese while stirring constantly, do not add all of the cheese in one go otherwise it will not result to a smooth texture. Do not let the mixture boil. Once all of the cheese is melted add in the kirsch, mustard and nutmeg. Turn heat odd then transfer into the fondue serving pot, set flame to low just to keep it warm. Good to see you using the traditional Emmental and Gruyere cheeses Raymund, these really DO work the best with regards to taste! The melting point of soft, hard, old and young cheeses are completely different, some will turn to the consistany of rubber and resemble car tyre material really fast so it’s worth spending the money to get it right the first time. San ko ba natikman yan. Ah sa macau. Sa breakfast buffet meron sila cheese fountain tapos daming klaseng tinapay. Sarap nyan bro….. Lupit mo talaga idol!!! My favorite is roasted vegetables with fondue, this is a wonderful idea for fall. Thanks for the history lesson too! I have a fondue set somewhere in the basement. I need to pull it out and make this fondue ASAP! Love the combo of cheeses and it’s the perfect fall appetizer. I haven’t had cheese fondue in years! You’ve got me craving it! Yours looks SO GOOD! Glad you used the kit! It looks so delicious. we had a fondue party last winter but the only one that turned out well was the chocolate. Your cheese fondue looks yummy! I love a warm cheese fondue and I’m also a fan of the hot oil ones. We went to the Melting Pot (a fondue chain in the US) but I wasn’t that impressed – homemade ones are always so much better. Your version looks like a great app for a party.